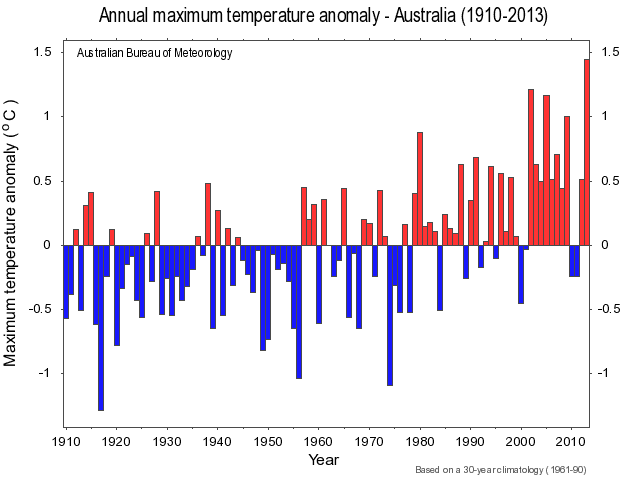 In 2013, the average annual temperature across all Australia was 1.53°C higher than the 1911-1940 mean. The previous record was set in 2005, when the average temperature was 1.36°C above the 1911-1940 mean. The probabilities of Australian annual, spring, and September temperatures were calculated for experiments incorporating anthropogenic and natural forcings, and they were compared to a parallel set of experiments including only natural forcings. The long control runs with no changes in external forcing factors (piControl) completed for each participating CMIP5 model provide an estimate of the unforced variability of the climate. in the historical experiment (historicalNAT), the second hottest year on record was entirely outside the bounds of the simulated natural climate variability. ...Indeed, further analysis of Australia’s 2013 record annual Tmean also demonstrates anomalies were largely outside the modeled natural variability, with the attributable risk to anthropogenic forcing essentially 100%. That's strong stuff. I hope Tony Abbott and his advisers are taking note. I don't expect Maurice Newman will even read it, let alone allow it to permeate his consciousness. Whereas the above paper was mainly about the full year of 2013, another paper in the BAMS Supplement focused just on the Australian summer of 2012-13. This had the rather long title: "Increased simulated risk of the hot Australian Summer of 2012/13 due to anthropogenic activity as measured by heat wave frequency and intensity." The title explains the focus of the research and its approach. The January-averaged maximum temperature was the highest on record for Australia as a whole. The national anomaly was +2.28 °C, a substantial increase on the previous record of +2.17 °C in January 1932. All States and the Northern Territory recorded positive monthly anomalies for maxima with four also recording anomalies in the top six records: Northern Territory +2.52 °C, highest on record; Queensland +2.62 °C, second highest on record; New South Wales +3.66 °C, third highest on record; and South Australia +2.89 °C, sixth highest on record. The Australian summer of 2012/13 was the warmest since records began in 1910 (Bureau of Meteorology 2013a). The season was characterized by the hottest month on record (January), where the continental mean temperature reached 36.9°C. Averaged nationally, the last four months of 2012 were 1.61°C higher than the long-term mean. Rainfall was below average for much of the country since July 2012. While focusing specifically on seasonal heat wave measures, such an analysis also allows for the assessment of whether changes in risk are consistent for heat wave magnitude and frequency, thus providing important information for adaptation and impacts groups. the peak amplitude (the hottest heat wave day), representing intensity. ...A striking result is that during 1955–2012 and 1984–2012, the risk of the summer of 2012/13 having such a high heat wave frequency anomaly increases faster than heat wave intensity. During the latter period, the risk of experiencing a summer heat wave number (intensity) greater than that of 2012/13 increases by almost three-fold (two-fold) compared to a world with no anthropogenic forcing. This corresponds to a reduction in return periods to ~33 and 3 years, respectively, compared to 1955–2012. It is also an interesting and important result that even though the 2012/13 summer heat wave intensity was much less “extreme” than heat wave frequency (see corresponding return periods in Table 10.1), human activity has clearly increased the risk of both characteristics occurring. Thus, there is a calculable human influence on the hot Australian summer of 2012/13. When isolating 1984–2012, the 2012/13 heat wave frequency increased three-fold due to human activity, while heat wave intensity increased two-fold, compared to a climate with no anthropogenic forcings. ...a combination of a strongly anomalous atmospheric circulation pattern, background warming, and dry and warm antecedent land-surface conditions. ...the extreme heat was made much more likely by important contributions from both the anthropogenic warming of the climate and the very dry conditions over the inland eastern region of the continent. The combination of these factors increased the probability of 2013 being Australia’s hottest year on record. ...The major area affected by the heatwave consisted of Victoria, Tasmania (particularly the western half), southern New South Wales away from the coast, and the southern half of South Australia. Over most parts of this region, it ranked alongside the heatwaves of January-February 2009, January 1939 and (from the limited information available) January 1908 as the most significant multi-day heatwaves on record. While peak temperatures mostly fell short of those observed in 2009 and 1939, extreme heat persisted for a longer period than it did in those heatwaves over some areas, particularly near-coastal regions of Victoria and South Australia (including Melbourne and Adelaide). Question: do I get right of reply? Or are you having too much fun doom-mongering? Saying "No" is fine. It's your shiny blog, your ball, you can take your ball home anytime you like. I would admire the honesty of "No". But saying "Yes" and then moderating the thing to death, would be cheap, shallow, and cowardly. Rum Runner, if you address your comments to the subject of the post and stay on topic, feel free. There's another article in the works about the PDO, so keep any comments below this article to the subject matter of the article itself, not the PDO. You will be able to comment on the PDO in the next article. One more word of caution - limit your responses and refrain from repetition as much as you can manage. I've noticed a tendency among some people in the last couple of days (as on some previous occasions) to thread bomb. If that happens, you'll risk some comments disappearing down the memory hole and not even making it to the HotWhoppery. How about something substantive, RR? Whining and posturing isn't substantive. BTW, while it was your comments that prompted me to write the article, it isn't about you. It's about the scientific papers in the September 2014 BAMS Supplement. you're = your and "the scientific papers" = "scientific papers supporting whatever point you may make"
So essentially that's a "No". * "address my comments to the subject at hand"
* I replied to your criticisms with ones of my own - it's called debate. My posts were still moderated. To paraphrase Jack Nicholson's character "Debate? You can't handle debate." Phrases like "stay on topic,", "keep.. to the subject matter", "too far into the realm of fantasy land", "One more word of caution" - these are all just defensive get-out clauses, that you can deploy to neuter the debate. Who decides if things are "On topic" or "fantasy"? - well you of course! And from my experience before you are NOT an honest broker. I'll pass. This blog can remain for the purpose for which it was apparently intended: as a circle jerk between like-minded alarmists. Interpret it how you will. If you can't comply with a simple request that any discussion board would view as reasonable; if you cannot do something as simple as writing about the science and sticking to the topic then I'm not interested and I doubt any other readers will be interested either. Your previous "answers" that were moved to the HotWhoppery went there because they bordered on the fantastic, plus they weren't about science, they were mere unsupported statements of your beliefs (I presume), plus IIRC you were just repeating yourself. Plus you admitted that you reject science on political/ideological grounds (you even regard science as "political advocacy" which is extremely weird). HotWhopper is to demolish disinformation not promote it. I'll also point out that only two of Rum Runner's six comments to the other article were moved to the HotWhoppery, in case anyone thinks I didn't allow any of them. Does anyone remember the conversation between Evan Jones and Victor Venema on this blog. Evan was saying how Victor was an excellent scientist. Victor said if that's the case why am I so heavily moderated on WUWT. That is the difference. Here stick to the science and you will be fine. On WUWT it's censor science and make crude jokes about scientists name as they did with Victor. Of course if somebody thread bombs threads here with voodoo science insulting everyone at the same time then they will have posts removed. Otherwise the conversation would be obliterated by trolls. So essentially that's a "No". ... I'll pass. ... would be cheap, shallow, and cowardly. I think someone is wimping out after his fearless words. Sou's conditions are quite reasonable. But you know if you cannot Gish Gallop you may be pinned down and have to admit you were wrong somewhere. Still waiting for an explanation of your 2014 spike traveling back in time! Do the"pseudoskeptics" claim Rum Runner as one of their own? That has got to be embarrassing for them. This paper is accessibly discussed in a GISS research brief here where the key results are illustrated very clearly, eg. here. HSR12 used analysis of past temperature data, not model-based projections of future temperature change. It described what has already happened. The results are unambiguous and there is no comfort there for the lukewarmers or the 'unconcerned'. Nor is it possible to ascribe a multidecadal one-way global trend to an oscillation without violating conservation of energy. So RR spits the dummy, packs up his bat and ball, and does an Anthony Watts. Not even a pretense at presenting substance. Well, no. Where RR went wrong was thinking that here, there IS debate. There isn't. There can't be, because Sou believes the consensus position. If someone disagrees, even if they present their views supported by facts, it will be disregarded because it is contrary to the mainstream view. As Sou says, this is a science based blog dedicated to showing why sceptics have no case, so by definition there can be no dissent. So RR hasn't a hope. Whatever he might claim and whatever evidence he may present, it will be waved away because it doesn't match the science. End of story. Bit like religion really. Whatever he might claim and whatever evidence he may present, it will be waved away because it doesn't match the science. If his claims and his attempts to support them are nonsense, then they fail. The fault lies in the weak argument. Not in the least. Asserting something repeatedly, without evidence and in the face of correction, as RR does, is much closer to the faith-based mindset. Your comment is another example. "...it will be waved away because it doesn't match the science. " Er, yes. That is exactly why it is waved away. Billy Bob wrote: "Well, no. Where RR went wrong was thinking that here, there IS debate. There isn't." I don't know what Billy Bob is referring to when he talks about "debate". A lot of debate goes on within science, as anyone who does scientific research or bothers to read about it knows. Billy Bob then went on to say: "There can't be, because Sou believes the consensus position." That's a different issue. I accept accepted mainstream science. I like to follow the different trains of thought at the frontiers of climate science. I enjoy following the vigorous debates that scientists have among themselves in the literature and elsewhere (and with others). The word "believes" that Billy Bob chooses sounds more like faith than critical thought. It's not a word I'd choose. Billy Bob then said: "If someone disagrees, even if they present their views supported by facts, it will be disregarded because it is contrary to the mainstream view." There is quite a bit wrong with that statement, so I'll break it down. First of all, let's take the part down to the words "If someone disagrees, even if they present their views supported by facts" and notice that Billy Bob doesn't support any of his comment by facts, let alone this statement. Then look at the whole: ""If someone disagrees, even if they present their views supported by facts, it will be disregarded because it is contrary to the mainstream view." Billy Bob hasn't been here long and he may have glossed over a lot of comments. He might have missed some of the mammoth threads where people disagreed and weren't disregarded, for example: here which continued on here. What I just did was link to "evidence", which Billy Bob failed to do. So can we disregard Billy Bob's statement using his own criteria? There is one more thing that Billy Bob explicitly assumed in that sentence, which is what science deniers seem to do quite a lot. He wrote: "it will be disregarded because it is contrary to the mainstream view." That's jumping to a conclusion that it will be "contrary to the mainstream view", with no basis in fact. There are a lot of times when there may be disagreement without it being "contrary to the mainstream view." It might be because when people disagree about science here or present different views, they typically don't behave in a confrontationalist manner. Maybe Billy Bob only recognises something as disagreement when it is associated with aggression. I don't know. Here's a recent example (by coincidence, from one of our recent guests) where there was discussion of different viewpoints leading to a better understanding of the science. "As Sou says, this is a science based blog dedicated to showing why sceptics have no case, so by definition there can be no dissent." The first part is almost correct though a stray lurker might get the wrong idea. I'll rephrase it to make it more clear. This site exists primarily to demolish the disinformation promoted by disinformers and fake sceptics and replace it with science. Then there is Billy Bob's ridiculous claim that because this blog is science-based "there can be no dissent". He could hardly be more wrong. There is a lot of dissent in science. It looks to me that Billy Bob has never worked in science and doesn't read scientific journals (or even blogs), or he'd know that science was all about rocking the boat, breaking new ground, challenging existing ideas, arguing with each other and publishing the various different ideas. That is, telling the world about it. Billy Bob wrote: "So RR hasn't a hope. Whatever he might claim and whatever evidence he may present, it will be waved away because it doesn't match the science." I don't have a quibble with that as a standalone statement. It is an indictment of Rum Runner, not of HotWhopper. Billy Bob has put the same proviso as I did and one that Rum Runner couldn't meet. I asked that RR support what he write with facts, with links to the underlying science. There is no evidence so far that RR is capable of providing evidence that supports his claims. He has provided evidence in the past, but it didn't support his claim and was waved away. Billy Bob finished with a flourish: "End of story. Bit like religion really." I'd say most of Billy Bob's point of view reflects a religious-style approach to science (and HotWhopper). His terminology ("belief"), his lack of any supporting evidence whatsoever, his willingness to believe the opposite to what the evidence itself demonstrates. One more thing - I suspect Billy Bob doesn't understand what I mean when I write "mainstream science". It encompasses a wide scope. It doesn't preclude contrarian science, provided it is based on a solid scientific foundation. It doesn't preclude Marcia Wyatt's stadium wave hypothesis - it would explore that notion, wait for her to come up with some explanation of how it works and then see if the evidence supports whatever mechanism she comes up with to explain it. It acknowledges that there are different schools of thought, for example about jet streams, what will happen in the Arctic and why etc etc. Thing is, most fake sceptics adopt what you'd call pseudo-science. It's not limited by anything other than their imagination. It's not grounded in fact and flies in the face of evidence. I'm talking about stuff like Force X and the Notch. Or weird notions easily contradicted by observations - like undersea volcanoes causing global warming (at the same time as them embracing a paper that suggested there was very little change in heat content in the cold deep ocean. Or silly ideas like Russian steampipes causing global warming. The word "believes" that Billy Bob chooses sounds more like faith than critical thought. Deniers often start their arguments with "I believe ..." or "My opinion is ...". They really do not see that that instantly marks them out as a bit lacking in critical thinking. When anyone replies they do not care what they believe or what their opinion is they act personally affronted. They do not seem to get that it is not about belief or opinion. The person, hereafter referred to as RR (not Rolls Royce) who was claiming the record heat in Australia 2012-13 couldn't be attributed to global warming, postulating that it was caused by the PDO, has also claimed something similar in 2010. Back then, RR accepted a $10K challenge by Chris Keating to show that the then current global warming was caused by natural cycles and not humans which lead to a blog article. To claim the $10K, RR provided, among other things, an AMO-Hadcrut3 NH/SH graph which used the AMO in the style of his PDO-Australian temperatures graph. Here is RR's mathematical 'trick' or 'tricks' or ... He/she took the years of the then current upswing of the AMO during one of its quasi-cycles to do the comparison with the increasing global temperatures which provides the illusion of correlation not to mention causation illusion. Omitting trend lines also hid any divergences between the AMO and global temperature plots. But 'RR's trick' gets better (in a negative sense). Extending the number of years of the AMO back to 1860-ish, we can see what its trend line looks like; it's horizontal. Superimpose the change in global temperature anomalies since 1860-ish on that AMO graph and the resultant graphs expose 'RR's trick' for what it is - mathematical chicanery. It's all a bit "pick a timescale, any timescale" by RR to get the trend he/she wanted to suit his/her purpose. Fast forward 4+ years, and RR has learnt from the rebuttals of his earlier natural-warming-via-AMO-explanation. Not in the sense of "I'm wrong" but in the sense of "I'll rework the presentation of my ideas on non-AGW". RR applies his 'trick' to the PDO, increases the noise level using monthly data, includes more cycles, but not too many, and continues to leave out the trend lines, as before, to provide that illusion of correlation. RR even references that BOM uses annual temperature data, which is down to them, while RR's PDO plot data is monthly. How brazen is that? The PDO, a relatively recent discovery, doesn't have the same 'history' as the AMO but if we go back 100 years and look at the PDO trend line it's horizontal here and here as befits a quasi-oscillator. Put the Australian temperature data against that and there is no correlation. Extending the number of years of the AMO back to 1860-ish, we can see what its trend line looks like; it's horizontal. Interesting background on RR; thanks for that. One point though. The ESRL AMO index is detrended, so I'd be reluctant to push this line of reasoning. Perhaps this analysis of AMO and GAT by Tamino points to a better approach? I concur BBD. Something got lost in turning and extending RR's mathematical technique back on his/her own argument but the pattern of RR's argument remains the same. Enough said. And ta, PC. "Maybe Billy Bob only recognises something as disagreement when it is associated with aggression. " You were just not aggressive enough. That juvenile response probably does portend more of the same. Sou, these brain dead deniers (RR and BB in particular) must be sad pathetic people. Imagine being so bereft of meaning in your life that you have to troll in the way that they do. Jammy Dodger? ... Not exactly a challenge, that one. Billy Bob, you have been HotWhoppered. But I saw your wounding comment before it disappeared which was so hurtful I feel stung into replying. Basically you are saying that my opinion cannot be changed? Presumably because I am so brainwashed and following my cult religion there is no possibility of changing my view? Oh, you are just so wrong. And I find such a criticism coming from you quite laughable. You admit you know no science and struggle to understand why the atmosphere has weight. Yet you think you have the skills to judge scientists' work who have worked for many years to understand such concepts. For me personally I have worked as a scientist for many years. I have struggled with understanding bias, defining objectivity and how to analyse critically. And after many years it is still a struggle because I understand how beguiling it is to take the easy option. Consequently my "opinion" is as malleable as melted butter. Whereas you? You have not even made the effort to understand the pressure in the atmosphere, let alone any other scientific idea. And you think you can just read a few anti-science blogs and parrot them without critically thinking about them. And when people try to point out the flaws in the thinking you just dismiss them without investigation. And that is so typical of anti-science people. I have spent far too many hours investigating denier claims to understand if there is anything in them and trying to debate with them. They will not stay still long enough to establish a basis for discussion. Like RR when they make a mistake they do not change their opinion or adjust it. They do not answer reasonable queries because they are too stuck on their railtrack that leads to the answer they want. On the whole you see a lot of Dunning Kruger symptoms or obsession from people like RR who, despite apparently spending a few years on his pet theory, has not shifted his outlook one centimetre. That is not science. So, you are wrong. People like me shift my opinion at the drop of a hat. Show me some evidence - I will shift my opinion. And actually that is the difference between you and me. (And presumably most of the other people here). There's a certain irony here. Consider Linzen, who decided thirty years ago that negative cloud feedback means a low climate sensitivity and has spent his time since trying to find something - anything - to support that fixed belief. Watts came up with UHI and sticks to that fixed belief despite everything. Spencer and Christy have their fixed belief in a cuddly god which will step in at some point to stop humanity harming itself. Curry shows every sign of having fixed on the 'stadium wave" in just the same way. Svensmark is fixed on cosmic rays. Run Rummer has fixed on the PDO. Pointing out their errors is like throwing farts at a wall : nothing will ever stick. Evidence has no impact on these people, and they are the heroes of climate denial. Memo to Billy Bob : screw you, dickhead. Hi Sou. Jo Nova has been defaming BoM again. Do you think there any merit to her assertions? No. There is as much merit to her assertions as to her assertions that global warming is caused by a magical mysterious Force X and the notch. Ken Stewart doesn't even understand averages. He's not worth giving the time of day. Ken is probably just a dumb ignorant denier with too much time on his hands. Jo Nova and Jennifer Marohasey are not dumb ignorant. They don't just spread lies because of their extremist ideology, they earn money from promoting disinformation. They are doing their utmost to hasten the sixth major extinction and see the demise of the human species. They are not "good people". I agree. What kind of person would want to deliberately manufacture misleading information to discredit scientists who have identified a credible risk?